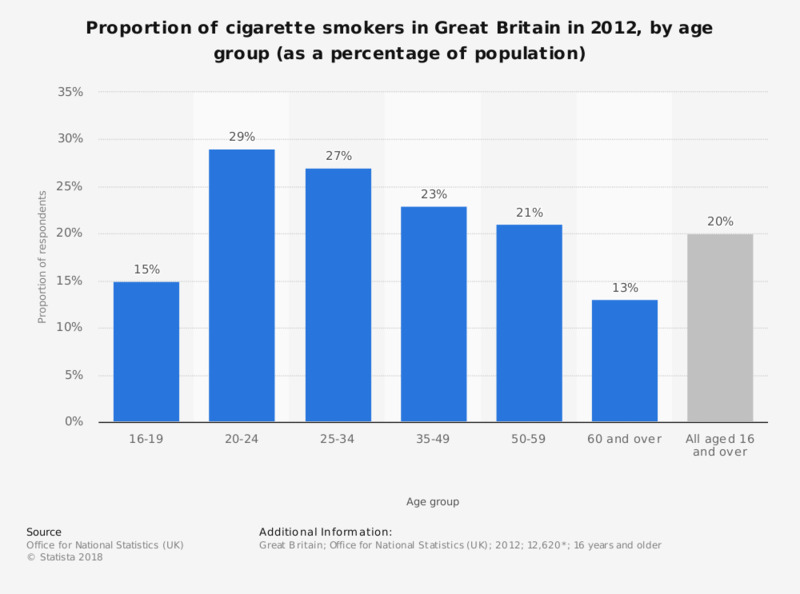 This statistic shows the proportion of cigarette smokers in Great Britain in 2012, by age group (as a percentage of population). The age group with the highest proportion of cigarette smokers was 20 to 24 year olds. The 2012 data alone cannot tell us if the correlation between smoking and age is attributable to generational differences in attitudes to smoking, or whether young people smoke more generally. It is clear, however, that smoking has seen a general decrease in popularity in recent times. Statistics on "Smoking in the United Kingdom (UK)"
To what extent do you agree or disagree that parents are provided with enough information by the UK government on the health risks to children and teenagers of smoking? Do you think people should be allowed to use e-cigarettes in public indoor places, like bars or restaurants, or should they be banned in these places? How old were you when you started smoking on a regular basis, i.e. at least once a week? Regarding smoking cigarettes, cigars, cigarillos or a pipe, which of the following applies to you?